This was written as a guest blog post for a great friend of Indie authors, Paul Martin. It was published on his Self Publisher’s Showcase blog on January 24th, 2014, and is my most popular piece ever. I’ve been reading contradictory opinions about book marketing and what does and doesn’t work, so I thought I’d share my personal experience on the matter, warts and all. 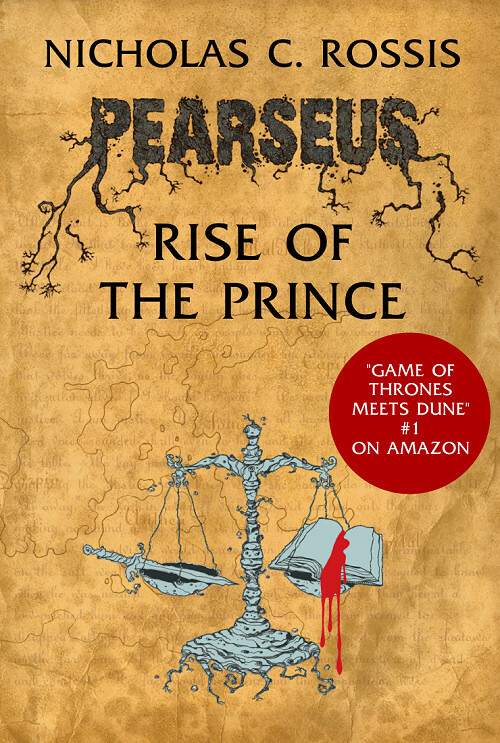 I am the author of the sci-fi series Pearseus, and published simultaneously the first two books on Amazon KDP. I went exclusive with Amazon because I had a non-existent fan base (what people call Author Platform, which is really the websites, blogs etc. that mention you), so I figured I had to start by introducing my books to the public. KDP allows you to reach an insane number of readers, and handing free copies for five days seemed like a small price to pay. Ideally, number 5 would have come at the beginning, perhaps a year in advance. However, I was too absorbed with writing to work on that. So, on October 17th I published the books. Shortly afterwards, I started my Twitter account. I had a better fan base on Facebook, with some 300 Likes, and experimented on building a Tumblr blog. This has now (d)evolved into a place for me to see photos and quotes I like, with just a dozen followers, whereas the Twitter account has mushroomed to almost 1,000 followers. Following an early start of some 20 sales, mostly friends and relatives, things crawled to a halt. Then, I started my free days. Believing my second book to be stronger, I decided to promote that. I focused on weekends for my free days, and used the Self Publisher’s Showcase and the Author Marketing Club’s Free Kindle book submission tool to advertise it. The Author Marketing Club (AMC) page lists 24 sites that will list your free ebook, either for free or for a small fee. I spent almost a day setting up my listing with half of these, and paid some $40 in total, then waited. I had some 270 downloads on a Sunday, which means I had reached 270 readers I had no chance of reaching otherwise. So, from my point of view, it was very successful, however it failed to translate into sales: I sold maybe a dozen books during the rest of the month. I tried tweeting about the book and using Facebook. At some point, Facebook informed me a particularly dignified and tasteful promotional post had been seen by almost 1,000 people – which translated into absolutely zero actual sales. The number of downloads was almost exactly the same, meaning I had now reached a little over 500 readers. However, the post-giveaway sales effect was once again limited and faded rapidly. In early December, it was time for my second giveaway. Once again, I used the Self Pubisher’s Showcase and the AMC tool, this time publishing on the second half of the list. I had also written a couple of guest blogs pieces, the most successful of which concerned my thoughts on self-publishing vs. traditional publishing and the funny story of how my dad learned I had become an author. I was selling far more hard-copy books through Createspace, most of them because friends and relatives wanted to use my book as a novelty Christmas gift (some 100 people were kind enough to do this). Since they wanted autographed copies, I ended up ordering these books using my author’s discount, 5-10 at a time, and signing them, before selling them to my friends. Money-wise, I wanted to cover my p&p costs, not make a profit, since my priority was – and still is – to establish a brand, not to make money at this stage. Then, in late December (21-22) I had my third giveaway. Again, I tweeted about it, this time sending direct tweets to some of the friends I had made, asking them to retweet (I felt embarrassed doing so, but I bit the bullet and groveled. It paid off, as you’ll see). I also used the Self Pubisher’s Showcase and the entire AMC list, spending some $60 to ensure my listing. I had also increased awareness of my book with some more interviews and book features. Finally, I later realized that the giveaway had been picked by a kindly Reddit editor, which helped. This time, the giveaway reached almost 4,000 people, astounding me. Based on the strength of that, the book reached #1 in Metaphysical and Visionary and #73 in the entire Free Kindle Store (it helps picking less competitive categories for your book). 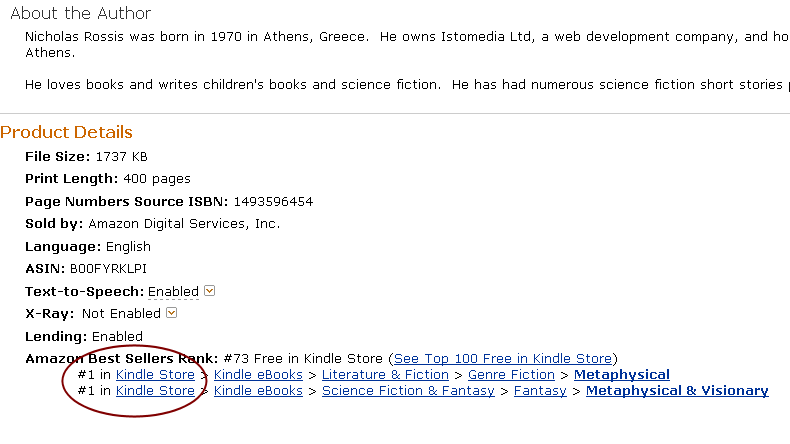 Within a brief, ecstatic moment, I had become a best-selling author, reaching #504 in Author Rank for Science Fiction. So what did all this mean for my sales? It translated into some 40 sales of the other book, some 40 sales the next month with no advertising or promotion, and a couple of reviews. I was still unsure as to why the sudden success, so in January I only promoted Year 18, the first book in the series, using up all 5 free days simultaneously, as I realized the 3-month period had almost expired and I had run out of days. People say the best days are Thursday, the weekend and Mondays, but in my experience it’s more like Thursday, Sunday and Monday. 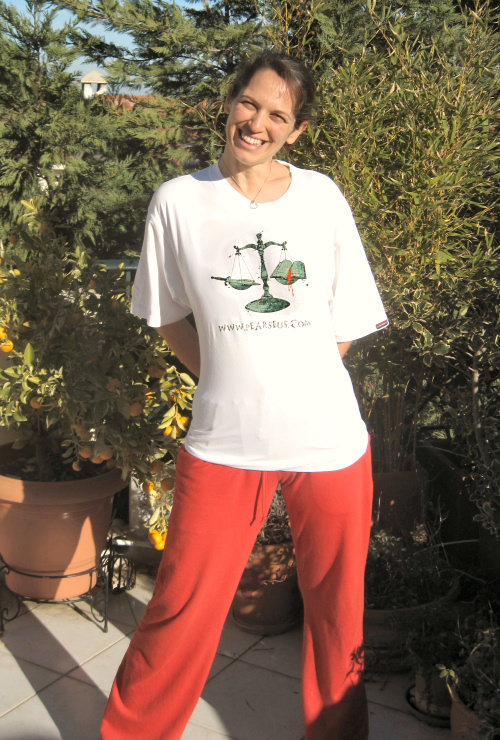 This time, I advertised on the five sites that I felt had proven most successful. These included the Self Pubisher’s Showcase and SweetFreeBooks, among others. I also mentioned it (to a much smaller degree) on Twitter and Facebook. During the five-day giveaway, some 400 copies were downloaded, helping Year 18 reach #1 in Metaphysical, thus creating another best-seller. This time, however, sales of the other book remained pretty steady, at a couple daily. As you can tell, I’m still experimenting with my marketing. It feels great to think that some 5,000 people have downloaded my book, although I’m aware that maybe 10% of these have actually read them, and very few reviewed them. So, what ten conclusions have I drawn from my first 3 months of marketing efforts? It’s best to have more than one book out there. One book’s free days led to the sales of the second book picking up substantially. The effect seems to grow exponentially, from what I’ve heard. Don’t let marketing distract you from your writing. 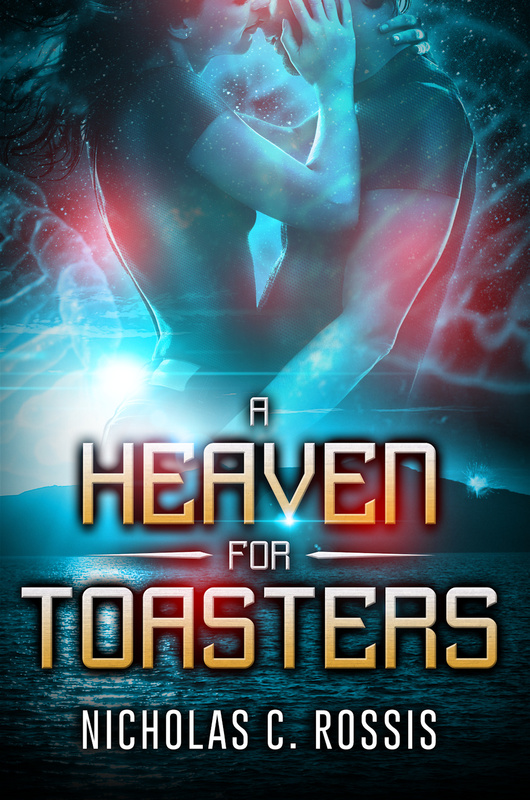 My marketing efforts distracted me from my writing for a while, but also allowed me to make new friends who have offered to beta-read and help out with my next book. I’d now like to focus more on writing, and have the third installment in the series ready within a couple of months (I’m now two thirds into the first draft). Because of the free days, 5,000 people will now influence where Amazon displays my book. That, to me, is the most important thing I’ve gained; the “people who bought this also bought Pearseus” recommendation is a huge asset. The fact that both books have reached #1 at some point is a great selling point. Buying a book from an author you’ve never heard before is a risk. We all have limited time, and too many books to read. 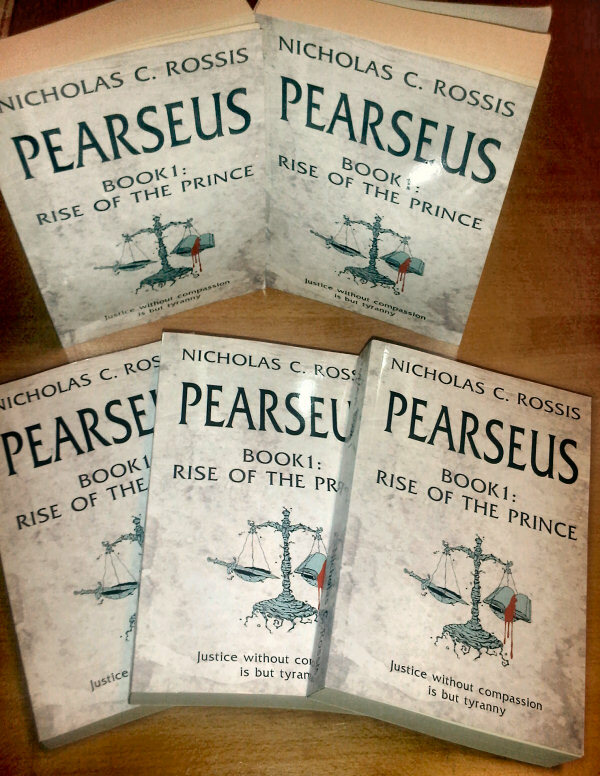 “Author of the international best-selling series Pearseus” sounds much more convincing, than “new author”. It doesn’t sound too bad as an answer to the dreaded question, “so, how’s your book doing?”, either. If I have enough time (I do juggle a morning job and a family, too), I’d like to get more involved with Goodreads, Reddit and KBoards. But as Rayne Hall said, you can only manage one social medium properly at a time (she’s considered somewhat of a Twitter guru, so be sure to follow her). I’ve placed some (mostly free) ads on websites. The problem is that they get lost among the hundreds of other ads there. So, I’m now focusing on sites and newsletters that feature no more than a couple of books at a time. Free days do work, just not as people expect. If your expectation is that you’ll publish a book, give away a million copies and sell hundreds of thousands because of that, you should probably prepare for disappointment. Free days are part of a greater strategy – it’s a marathon, not a sprint, as I’m fond of saying. Make sure you have some reviews from your friends and beta-readers ready as soon as you publish – and certainly before you start your giveaways. Few readers will download something just because it’s free; they also need to feel there’s at least a chance of reading it eventually. Also, it’s a good idea to ask for a review at the end of the book (Kindle now does it automatically). Do everyday something to promote your book – be it a tweet, asking for a review or telling someone about your book. But don’t forget you’re a writer, not a marketer (I know I’ve said this already, but it bears repeating. 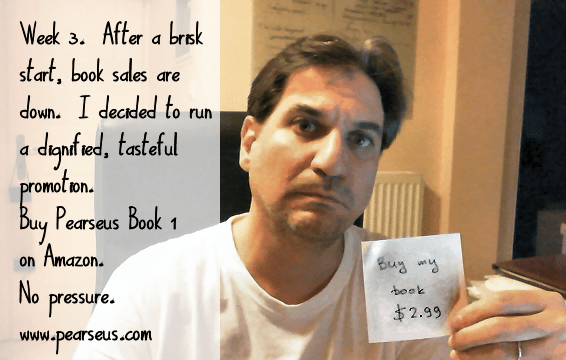 Too many Indie authors publish one book and market it ad nauseum, losing their focus). From what I’ve read, most authors need at least ten books before being able to live off their books. My number one conclusion? Before starting any marketing, be sure you have the best possible book you can. I had a dozen people read it, to make sure we had weeded out as many typos as possible. I’m not saying you should wait until your writing is perfect to publish – for there is always room for improvement – but that you should confident it’s the best possible book you can write. Just because it’s so easy to get published nowadays, you shouldn’t rush to do so without checking thoroughly. Typos may be inevitable, but make sure they’re as few as possible before you publish. So, what were my next steps? At first, I focused primarily on giving away copies to my new friends on Twitter who kindly agreed to review them afterwards. This helped with reviews, although those didn’t really start coming in until I joined the Rave Reviews Book Club. I have also experimented with banners and ads, with mixed results. I also ran an Indiegogo campaign, with an emphasis on humor. Perks included naming a character after you. This proved very popular, and I raised some $700, which helped a lot with promotion. Finally, I became a lot more active in the blogosphere, with the help of some lovely people I have met online and on my blog. Since starting this weird journey, I’ve been astonished by the amazing, helpful people that comprise the Indie community. It feels strange to realize that people who are nominally your competitors are rooting for you and doing everything in their power to help you succeed. In a short three-month period, I’ve become a best-selling published author, climbing one of the steepest learning curves I’ve encountered in my life. It’s been a roller coaster experience, but I’ve loved every minute of it. Along the way, I’ve met some great people, people who share the same passion as me, either as readers, reviewers, editors, proofreaders or authors, and this may well be the best part of this journey. It is these and the many friends I’ve made online that prompted me into writing this post, in the hope of helping others who wish to publish and are worried about making it, and it is to them that my final words are addressed: Take the plunge, and I promise; there’s a lot of people waiting to help you. Hi Nicholas, thanks for your invaluable post. I like your frank style of writing and looking forward to following this blog. One thing that I’d like to ask about is building a mailing list. 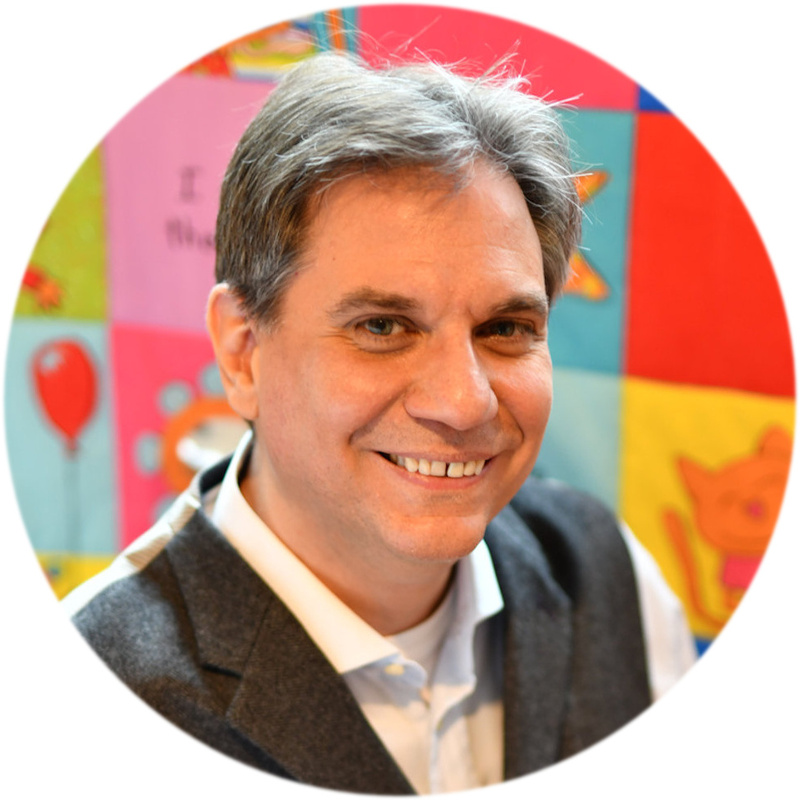 Thanks for sharing your personal authoring journey! I have a couple books in the works, and although my expectations are pretty low, it is still great to have posts like these as a sort of guideline for someone who hasn’t really lived in the author’s shoes at all. Good luck with your future endeavors, and congratulations on the children’s book!